LARDIERS IS MID WAY BETWEEN BANON AND FORCALQUIER. The self-catering accommodation consists of a large family room with French doors that open onto a charming private garden. Consisting of a modern well equiped kitchen, dining area with comfortable seating and utility room with washing machine, spin dryer, iron and board. You will find a large video library and also plenty to read - plus television, France 24, CNN, Sky news, ITV, BBC channels and FREE WiFi. The large first floor bedroom with king size bed and luxury en suit bathroom is accessed by a spiral staircase from the family room, over looking La Cafe de la Lavande. Ideally located, the newly restored lavender barn offers privacy and convenience, just step outside and you are a one-minute walk from the village center and it’s local restaurant, also a 3 minute walk from the ancient Chateau. The village of Lardiers is close to Banon where there is an excellent bookshop, small supermarket, restaurants, a wine bar, cafés, bakery, butchers and weekly market. It is the perfect place to unwind and experience French cafe culture. Within the region, one can sample world-class wines, wander through fields of lavender and sunflowers, shop in open-air markets, enjoy outdoor activities such cycling, swimming, paragliding and hiking, or simply explore the countless medieval villages in the area. Close by are the towns of Forcalquier, Manosque, Apt and Sisteron with their museums and medieval architecture. From this central Provence location day trips to Avignon, Aix en Provence, Marseille and many other internationally renowned places are within easy reach. Keywords: NEW converted barn for couples, with a private garden, in quiet family village, within 50 yards from the village restaurant. Mike and Rosi Wilson - Chalon before moving to France were key membars of Chalon U.K the furniture and kitchen design company. They have recently commenced a new business selling antiques and decorative arts in the UK. 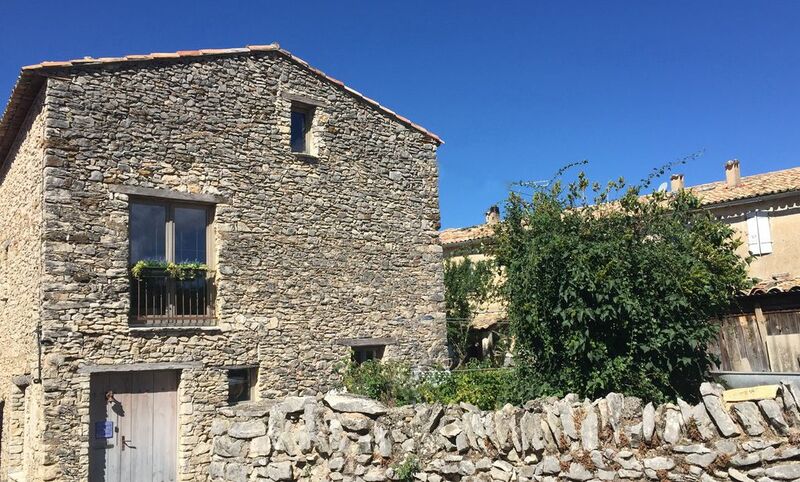 They have lived in Provence since 2003 and commenced the conversion of the 200 year old barn in 2009. We chose an undeveloped ancient barn, thus giving us the opportunity to design and create a home to our taste, whilst providing an independant accommodation for visiting guests. The development plan for the property was to maintain as many of the barn’s original features whilst providing modern comfortable accommodation. View more about Rosi CHALON. Spacious bathroom to include wet room. Pellet stove plus electric heaters. Dishes & Utensils for 6 persons. Ample room for 6 plus persons. Garden for dining and relaxation, adjoining family room. Great place to relax, very clean and neat, all the comforts that you need, plenty of space. Mike and Rosi were great hosts, very cheerful and accommodating. They were very helpful with directions to the area, and very good with places to see and things to do in the region. They did a fantastic job converting a barn into a very comfortably living area.The village has some old world charm. While the homes were old they were in very good shape. The village was quiet and restful. If you are looking to get away from the crowds this is a good place to go. We went during the winter holidays and the unit was warm and relaxing, good to unwind. Many street markets in the area. We did not have any issues or problems with our time there. It went very smoothly. Rosi and Mike were very helpful, they gave us many tipps about beautiful places to visit, such as the amazing lake, La Perle du Verdon. The La Grange de la Lavande is a perfect accommodation for a perfect Provance-trip. :) I can only recommend it! Lardiers is a very small village near nothing. The nearest town is 15 KM away, o everything must be done by car. That said, the renovated barn was very nice. The only problem was that there is no WC downstairs and the spiral staircase was difficult for my aged knees. Mike and Rosie are very charming and very helpful; Mike gave us a list of nearby attractions and road trips that allowed us to explore and enjoy Provence. I would recommend this property very highly to people who enjoy exploring by car, or just relaxing in the village and preparing one's own meals. Markets are available in nearby town that provide many local products, so cooking and eating can be a real pleasure. Our time in Lardiers was superb. We enjoyed immensely our stay with Rosie and Michael. Ther were very hospitable in enhancing our time with suggestions for various trips and markets in the area. The accommodations were tastefully appointed, clea, and user friendly. Kitchen was delightful and internet access was consistently available. We recommend highly. WE RECOMMEND THIS ACCOMMODATION TO ALL OUR FRIENDS. Bob & Charlene.FREELAND W.A. 98249. U.S.A.
We stayed at La Grange de la Lavande in the first two weeks of Oct 2013. We enjoyed Mike & Rosi’s hospitality and their great information about the surrounding areas in Provence. Everything is as pictured and the area is beautiful. The accommodations were as described and comfortable. Our friends asked us about where we stayed and we recommended La Grange de La Lavande to all. We hope to return someday. Description of ad is accurate and you get it all (and more). We stayed 2 wks from 21/12/12 till 04/12/13. Mike & Rosi, the owners of the gite, were very warm and welcoming and made sure that our stay was the best it could be... and it was indeed. We have never stayed in a holiday gite in such a great condition. Everything was super comfortable and super clean.